If you like your wings sticky and sweet, then you’ll love these Five Spice Chicken Wings. This recipe is a switch from traditional wings because you can never have too many chicken wing recipes, am I right?? 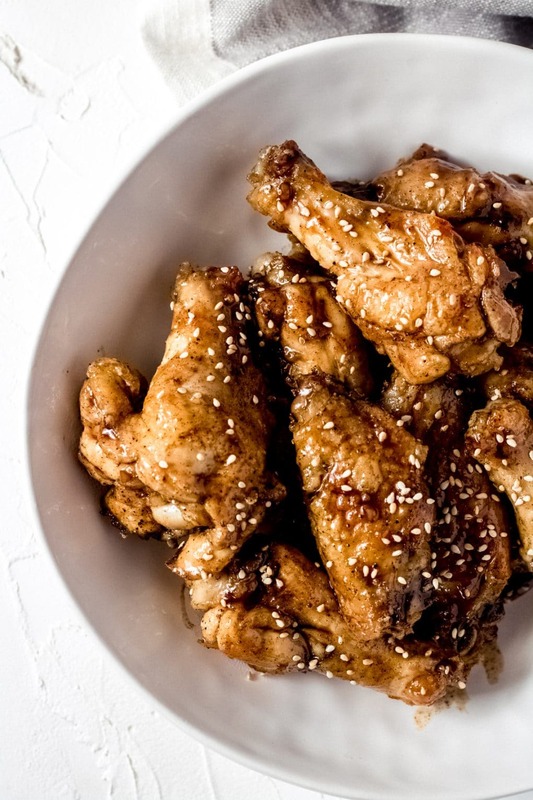 Plus these deliciously sticky wings are gluten-free, too! Never heard of Chinese Five Spice?? Well, you’re in for a treat! We’ll dive into what exact spices are in Chinese Five Spice in this post – but I promise you’re going to love it – especially if you like sticky Asian-inspired sauces! As you probably already know, we have a bit of an obsession with chicken wings in our house. From hot and spicy to salty to sweet and sticky – we love them all! 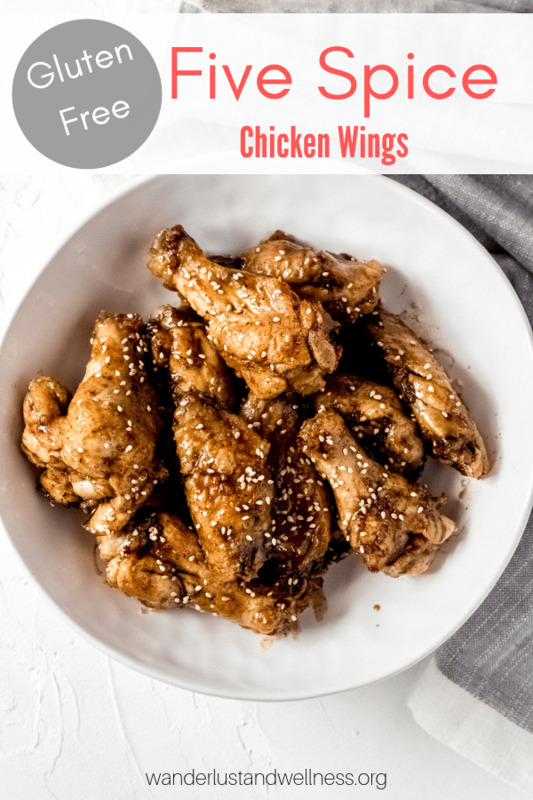 Chicken wings are perfect for party appetizers, game day snacks, or just a Friday night dinner in – chicken wings are a great gluten-free meal choice. With each of our chicken wing recipes, we mix up the sauces and mix up the cooking techniques to give you the best variety of chicken wing recipes. Five Spice chicken wings are Asian-inspired with a sweet, sticky sauce. I like to serve these alongside a hot option, a traditional option, and a saltier option – given my dinner guests a wide variety of wing flavors. Ready to dig into how to make these wings?? Preheat oven and coat the chicken wings. First, preheat the oven to 400 degrees. F. Then, in a large bowl, add the fresh, not frozen, chicken wings. Add the salt, pepper, and arrowroot powder, then toss to coat. 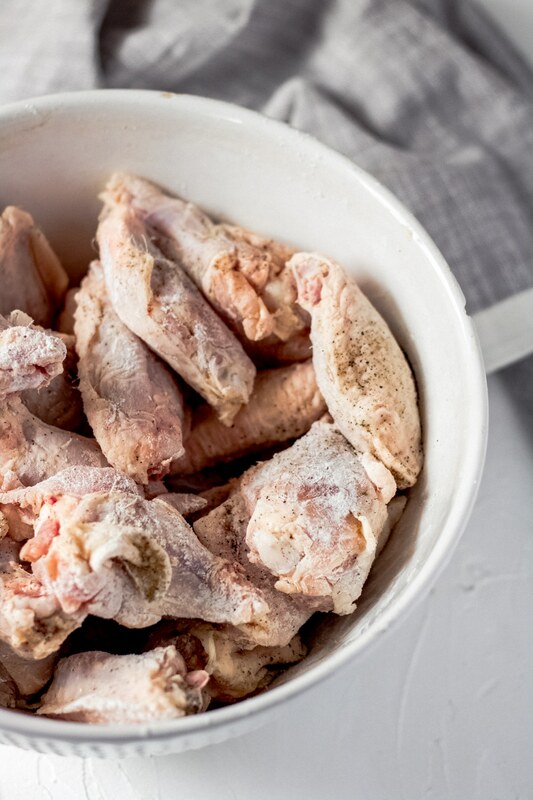 Place the wings onto a broiler pan, or a cooling rack placed onto a baking sheet, and bake for 45-50 minutes. While the wings are baking, prepare the Five Spice sauce. Add the water, coconut aminos, brown sugar, minced garlic, and Chinese Five Spice to a small saucepan. Bring to a boil over medium-high heat, then reduce heat to medium-low and let simmer while the wings cook – stirring occasionally. When the wings have finished baking, remove from the oven. To ensure they’re fully cooked – you can test the internal temperature to make sure they’ve reached 165 degrees F.
Coat the wings with the Five Spice sauce. The Five Spice sauce should have thickened as it simmered to a sticky sauce. If it still seems runny, you can add in 1/4 tsp. of arrowroot powder to help thicken it. Using kitchen tongs, individually coat each wing and transfer to a serving bowl. Top with sesame seeds and serve immediately. 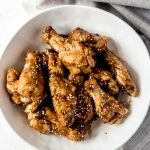 Are chicken wings Keto friendly? I am not completely familiar with the requirements of the Keto diet so I would recommend reviewing the nutritional information in the recipe card below. What is Five Spice made of? There are a few variations – however, common Chinese Five Spice is a blend of cinnamon, cloves, fennel, star anise, and Szechwan peppercorns. Is Allspice the same as Five Spice? No, Allspice is a specific spice, where Chinese Five Spice is a blend of spices. Can chicken wings be a little pink? With chicken, color does not indicate doneness because even fully cooked poultry can sometimes show a pinkish tinge in the meat and juices. It’s best to check the internal temperature and ensure it’s a safe 165 degrees F. When checking the internal temperature – be sure to not touch any bone when doing so. Enjoy these gluten-free sides to go with your Five Spice Chicken Wings! 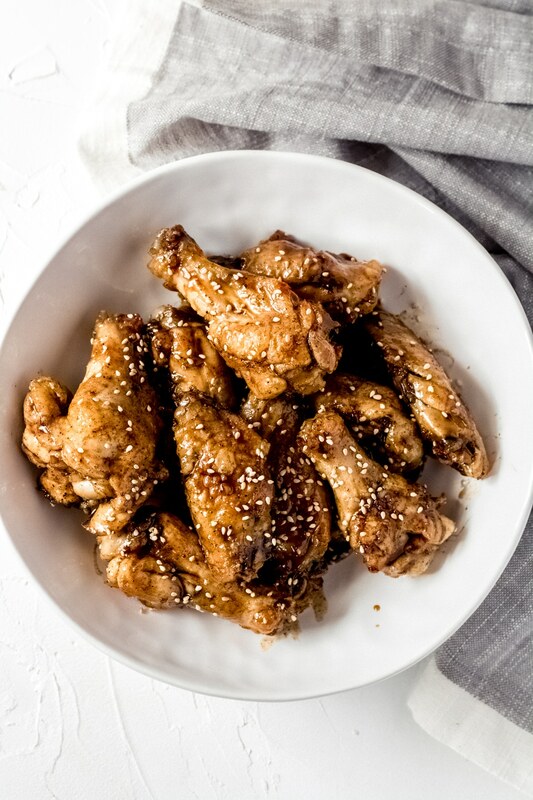 Gluten-free, five spice chicken wings – oven-baked with a delicious sticky five spice sauce. Preheat oven to 400 degrees. F.
In a large bowl, add the fresh – not frozen – chicken wings and drummettes. Add the arrowroot powder, salt, and pepper and toss to coat. 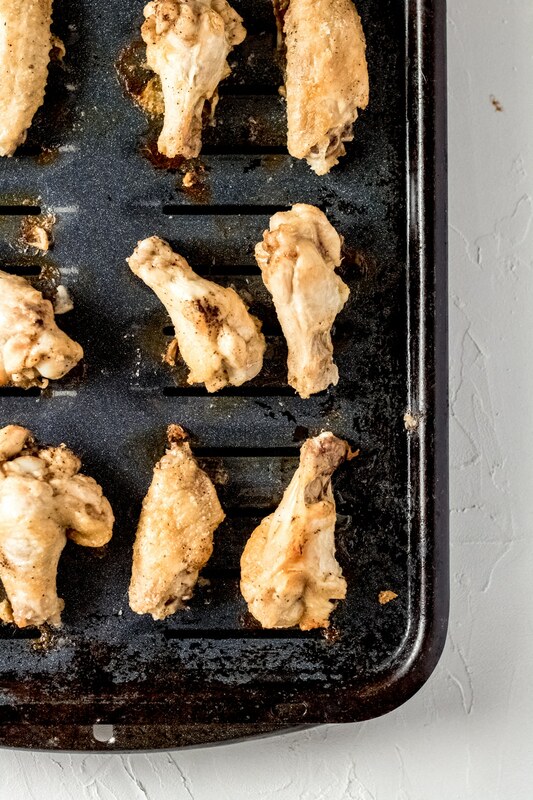 Place the wings onto a broiler pan, or use a cooling rack on top of a baking sheet. Bake for 45-50 minutes. 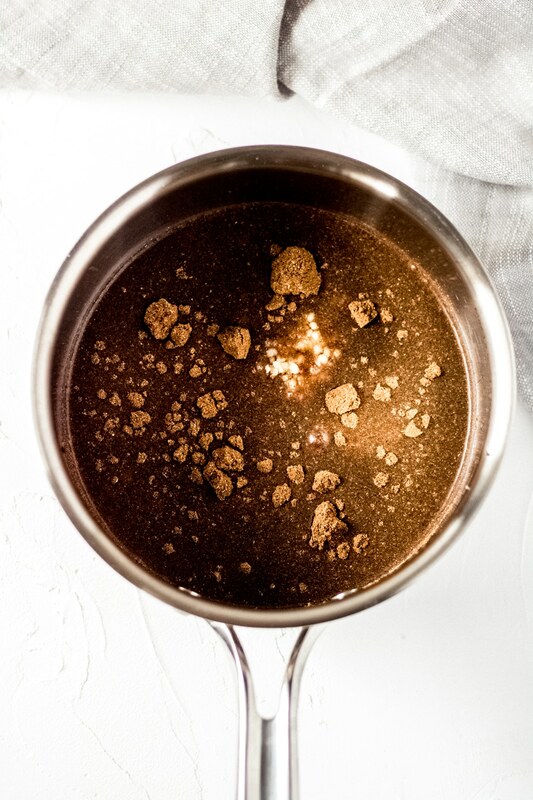 While the wings are baking, add the water, coconut aminos, brown sugar, minced garlic, and Chinese Five Spice to a small saucepan. Bring to a boil over medium-high heat, then reduce heat down to medium-low and let simmer – stirring occasionally. When the wings are done, remove from the oven. The Five Spice sauce should be thickened and somewhat sticky. If it appears too thin, add 1/4 tsp. of arrowroot powder and whisk until thickened. Dip each wing individually into the sauce and transfer to a serving bowl. Sprinkle with sesame seeds and serve immediately. If you do not have arrowroot powder, you can use corn starch. Wings should reach an internal temperature of 165 degrees F.